The newest improvements of Sony’s Translucent Mirror Technology make the latest released cameras Sony Alpha 65 and Alpha 77 to be the most responsive and fastest interchangeable lens in their category. The Sony Alpha 77 and Alpha 65 both include a latest designed Exmor APS HD CMOS sensor with 24.3MP resolution, and also the first XGA OLED Tru-Finder viewfinder in the camera industry. The CMOS sensor with the Sony cutting-edge BIONZ image processing engine could handle immeasurable high-speed data through the camera sensor, making it possible for high quality imaging, unprecedented response times, and ultra-low noise when using them to shoot for Full HD video or still images. This camera is the successor for Sony’s mid-level A700 camera. The AF system for the camera is balanced out by 19 AF points and 11 cross-type sensors. The shutter features a minimum release time lag of only 50 milliseconds, where we can see how Sony really determined to pursue for absolute speed with this camera. The ISO settings for this camera range from 50 and can set up to a level that is approximately 16000. The Sony Alpha 77 is features with an on-board GPS for geotagging, along with a shutter which is rated to 150,000 actuations. In addition, there is 921,000 dot, 3-inch, Xtra Fine LCD display pivots and tilts in 3 different directions for making the most from goofy shooting angles. This camera is not designed to be as robust as the Sony A77, which makes use of magnesium panels for camera body and seals several of the controls with the purpose of preventing moisture and dust having chance to creep in. However, it is asking for 35% off the price, which makes this camera appear to be a reasonably good deal. The Sony Alpha 65 also available with a kit included for $1000 with the 18-55mm zoom lens. There is another option that available with the new 16-50mm F/2.8 lens, so there would be no surprised if there are some other options make available at some point in near future. However, there seem to be some things missing for people to pay the camra with lower $900 price tag. 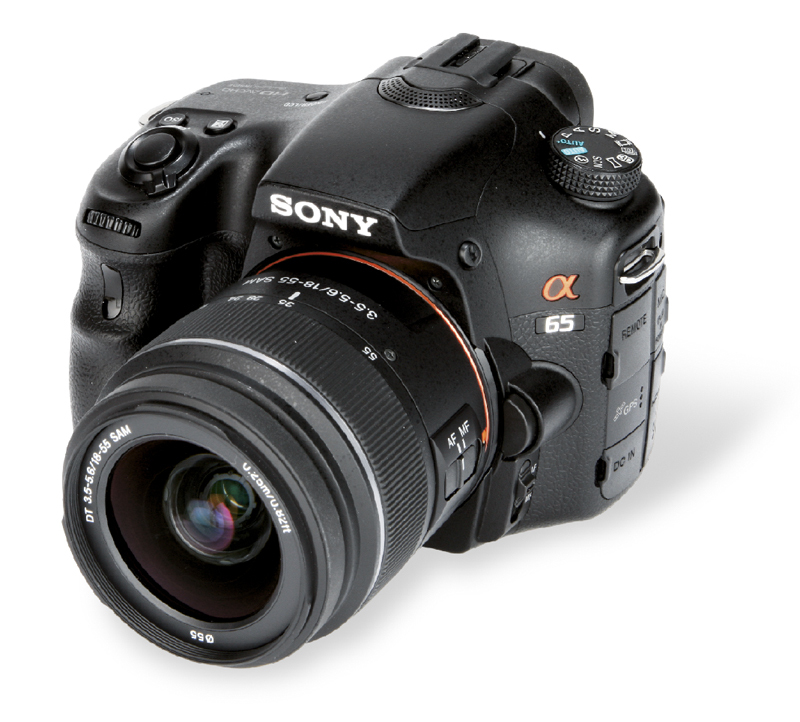 the Sony A65 has only 15 AF and 3 cross-type sensors compare to A77 that features with 19 AF and 11 cross-type sensors. The A65 also has 10 FPS with full-time phase detection AF and the A77 has 12. The lowest ISO setting is 100, more than A77 that having 50 and its 921k dot LCD screen only can rotates in 2 directions compare to A77 that can rotates in 3. The Sony Alpha A77 and A65 are designed for shooting some superb pictures that have excellent color and very solid exposure performance. These two cameras are very vivid and striking and they managed to generate top quality of JPEG output directly from the camera. Noise control is superb with the settings of low noise and also for high ISO. These cameras in addition provide constant focus while using the video mode. Another cool feature built in for these cameras is the GPS. Look at the price that asked by the Sony A65 you will know this is incredibly cut-throat deal for you. The camera body for Sony A77 is cost you just about $1,400, this can be best used to make comparison with the 18MP Canon EOS 7D. The camera body for Sony A65 is price at about $1,000, this also can be best used to make comparison with the 16MPNikon D7000 and once the price for this camera declines in near future, it will direct compete with the Canon EOS 600D and Nikon D5100. The Sony A65 apparently outrank these cameras when looking at the 10 FPS shooting, GPS as well as very fast focusing with the implementing of translucent mirror. Even though there is no optical viewfinder with SLT cameras, but the OLED EVF that being used for the camera is just amazing and helps make the view through appear to be very incredible. After you shoot for some good pictures, you still need a good printer if you want to print out the pictures that you shoot. Printer with good quality of Ink Cartridges are important in order for you to print out the picture with the same color that you view on your camera. Should I choose A65 or A77? Most of the people will have such question whether to get the less expensive A65 or go for the A77. As mentioned earlier, the A65 costs around $1,000 and the A77 will cost you more for about $1,400 (price of course will be changed from time to time). Since the Sony A77 is having better features, of course the price is also higher compare to the A65. If you intend to buy the Sony A77, you still need to consider if it is better for you to get the Sony A65 and spend more money on a better lens or get a more expensive camera body with a lens that cost you less. Deciding on a Sony Alpha A-mount interchangeable lens is crucial for you to shoot for good quality of image. Some people would prefer to buy a less expensive camera body but spend more money on better lens. Actually there are a lot of professional photographers are doing this way. If you have enough money, then the best solution of course will be buy the more expensive body of Sony A77 as well as better 16-50 mm f2.8 kit lens. On the whole, both Sony A77 and A65 are two of the best cameras that offered to you by Sony. The thing for you to take into consideration is that you need to fully grasp the difference between these two cameras as well as your own requirements. Once you know what you want, then you will be able to make the best buying decision and even save money on lenses and accessories.